The final day of any trip to assist people in need is always filled with mixed emotions for me. On the one hand, I feel the relentless tug of human suffering and need — the kind of need that makes my heart hurt and keeps me up at night. And, on the other hand, I feel the call of home — a place where I can be refreshed and continue to speak on behalf of those who have no voice. My wife will tell you that when I am home for too long I begin to show signs of an inverted homesickness, a longing to be back among the nations. I am absolutely passionate about guiding others to love God and to go to the nations to serve His purposes in the world today. Occasionally someone will ask me what I enjoy most about travel. My answer has remained unchanged for years. I love leading others to make meaningful connections among the peoples of the world, those for whom Christ died and who deserve an opportunity to hear His story and to see His love in action. A part of that equation involves educating teams about how to build bridges of love by learning about and appreciating the history and culture of those we have come to serve. To that end I try to set aside a day, when possible, to immerse teams in local culture and history. This task has been easier in Jordan because we are surrounded by layers of biblical history everywhere we have ventured. Yesterday, we set aside time to visit Petra, Jordan’s most valuable historic treasure hidden away in the southwestern corner of the country. This world heritage site is the legacy of the Nabataeans, an industrious Arab civilization that settled in this area during the time of Christ. 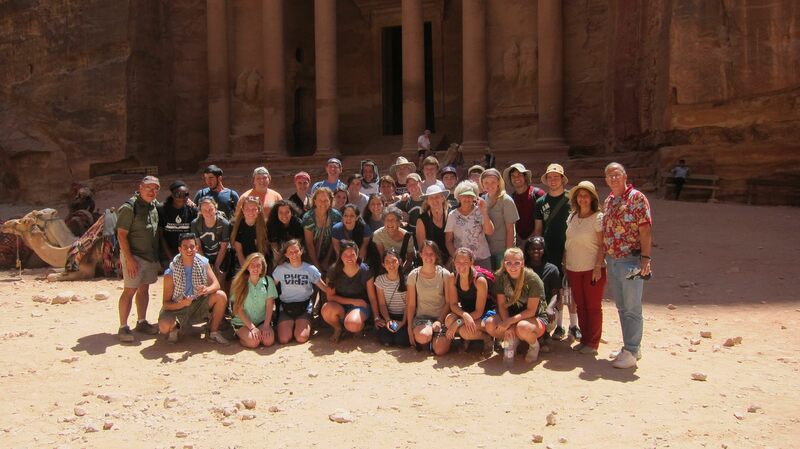 The most refreshing thing for me about introducing students to a place like Petra is seeing it anew through their eyes. The expressions on their faces was priceless when Petra’s Treasury, carved into the face of a sheer sandstone cliff, first came into view through the narrow canyon walls. Their eyes widened and they gasped. Petra will do that to you. It will stir your sense of wonder and imagination. Our students had a really good time learning about this magnificent place and what transpired here in the days when Jesus began His ministry in neighboring Israel. After spending a few hours at Petra, we headed to Wadi Rum, a take-your-breath-away valley sculpted into the sandstone and granite rock of Jordan’s southern desert by centuries of wind and weather. We jumped into the back of Toyota trucks and set off into the desert to watch the sunset. 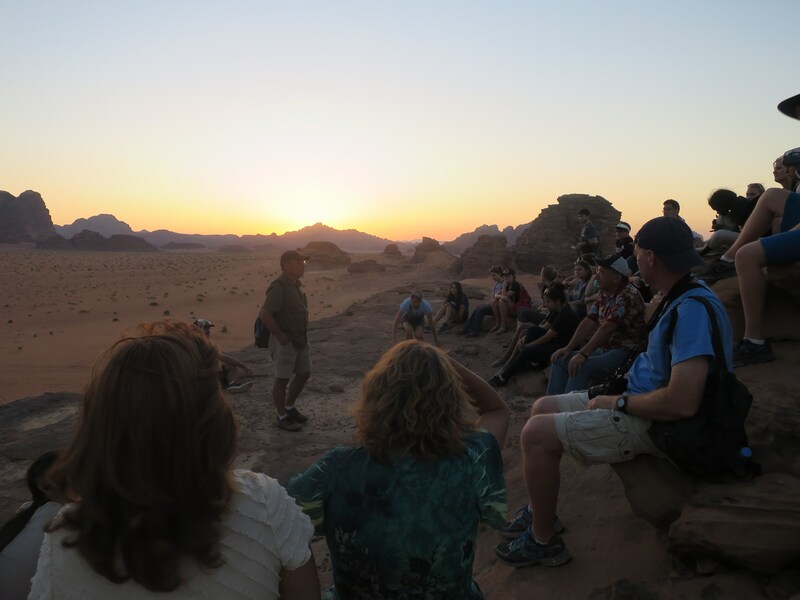 Our guides took us to the place where the movie Lawrence of Arabia was filmed, the story of T.E. Lawrence’s amazing and heroic Arabian adventure. 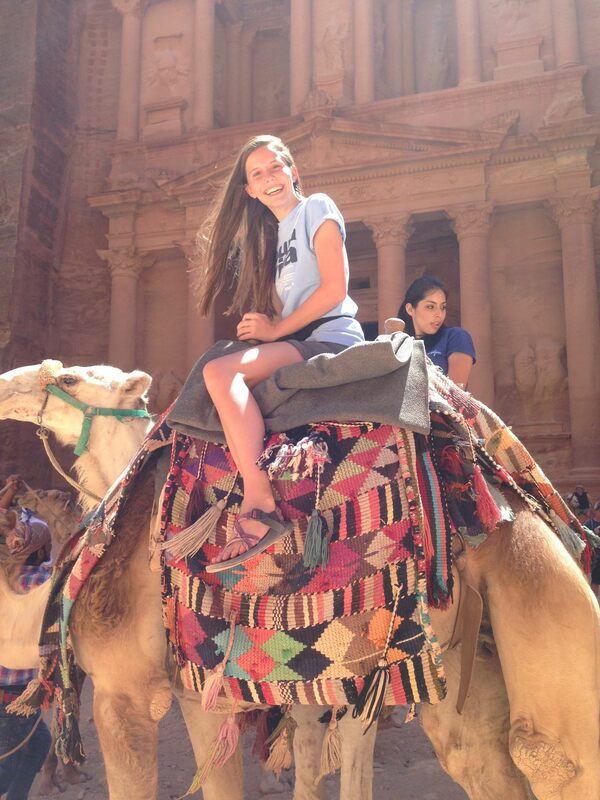 As if on cue, a herd of camels walked by, dwarfed beneath magnificent sandstone cliffs. As evening approached we climbed up to a high place and waited for the sun to set. In those final moments of waning light, we remained completely silent, listening only to the sounds of the gentle breeze. As the sun slowly descended behind the distant hills, it gave us a final gift of beautiful colors and hues splashed ever so briefly against the desert canvas. These final moments of the day reminded me of Zephaniah’s charge to “Be silent before the sovereign Lord” (1:7). Afterward we talked about the importance of cultivating the disciplines of silence and solitude. We are now back in Amman, packing and getting ready for our early morning flight to Istanbul and then on to America. Our students will not return home the same. God has done wonderful things through them and also in each of their lives as they have compassionately served Syrian refugees. 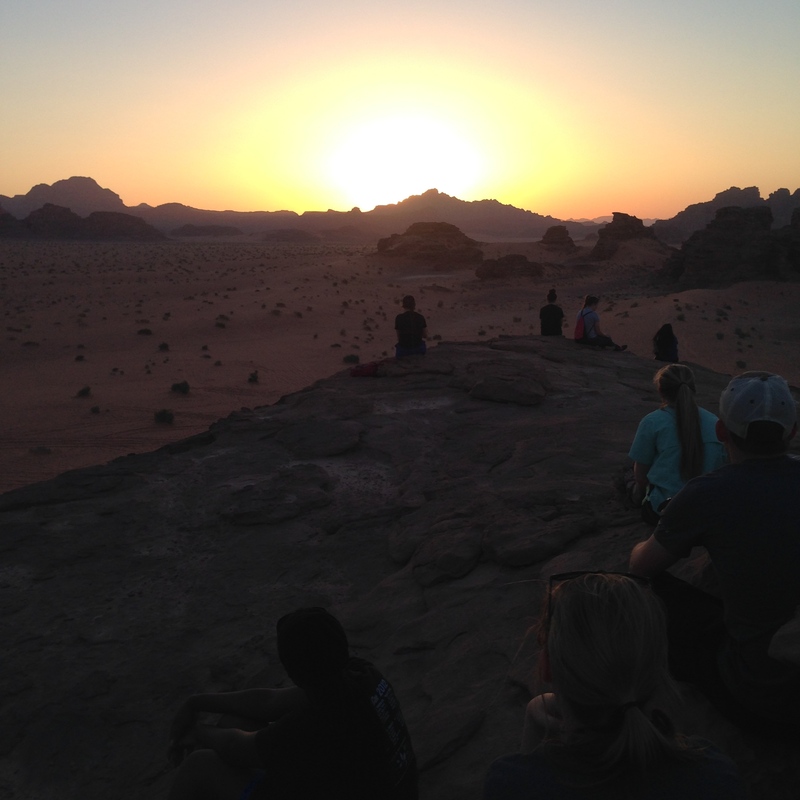 Just as the sun set in the desert of Wadi Rum, the sun is now setting on this chapter of their lives. There are new days ahead for each of them as they head off to their respective universities and other endeavors. May God bless each of them and continue to use them to bring glory to Him — at college and beyond. Great photos Omar! It is tremendous to see THIS unique group of young men and women experiencing Jordan history but also know they ministered to the Jordan people. I really like the first group photo you have at the top of your blog entry. Please tell Kyle Doe, “God bless you” as it appears he is about to sneeze. Thanks, Jeff. We’ve had a really great time here. Look forward to returning home and to our wonderful Kingsland family. Thanks for following our adventure. See Omars post below….some really cool insights that reminded me of you! Claire From my IPhone, forgive typos! Amazing trip Omar! Enjoyed the blog and prayed along with you. Thank you for leading the students and adults to be the hands and feet of Jesus to so many who desperately needed to be noticed and loved. Hope to see some of them in Perspectives this year! May the Lord seal the work of your hands. Thanks, Cathy. I appreciate your following our journey and praying for our team. I am excited about how God will continue to use these students to serve His purposes and to bring glory to Him. I had lots of good conversations with students who are sensing God’s call to missions. Very exciting stuff. I, too, hope that many of these students will engage in a Perspectives course either here in Katy or wherever they go to school. Hello Brother Omar, Its looks like a great team, & seeing the pictures of all of you. and also watching a some part of Jordan, from Bangladesh! so Good! great ministries of Jesus Christ, to the people of Arabic speakers! Thanks for following our journey, Mortuza. 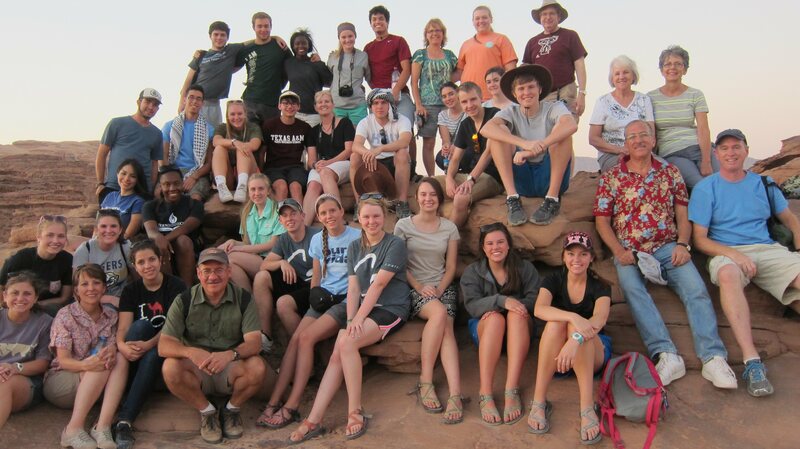 We had a wonderful time of ministry in Jordan and returned home last Friday evening.